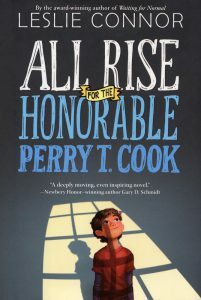 Perry, age 11, was born and has lived all his life with his mother in the fictional Blue River Co-ed Correctional Facility in Surprise, Nebraska, thanks to the current warden pretending he isn’t there. Then the new district attorney, Tom VanLeer, living in a nearby town, discovers his existence and “rescues” him from his mother and friends by bringing him home and becoming his foster family with his wife and his step-daughter, Zoey. Zoey is Perry’s best friend at school. For his class project, Perry decides to write the story of several inmates, who are his friends, and who agree to be interviewed. Regret for what they, including Perry’s mother Jessica, had done and how they have changed and are working toward parole, staying positive as much as possible, all send a different message than one might expect from prisoners. There are a few negative people incarcerated there, and Perry keeps his distance from them. District Attorney Tom VanLeer is certain his approach is the right one, even as he delays Jessica’s parole hearing, believing she is guilty of making her son suffer in prison. Zoey finds some of her stepfather’s viewpoints and habits condescending and irritating. She and Perry also find their new situation, as foster brother and sister, rather problematic. Perry is a wonderful character, with a positive viewpoint and an understandable confusion about things he has never encountered before, such as how to make the bathtub become a shower. His upbringing in the correctional facility has prepared him to give others a chance, and to challenge Tom VanLeer on his misconceptions. Other characters are well-developed and offer additional viewpoints as to how things can go terribly wrong and hopefully be forgiven. A terrific choice for grades 5-8 as well as adults.